TGV Cinemas MovieClub™ has come a long way since it first launched back in 2014. 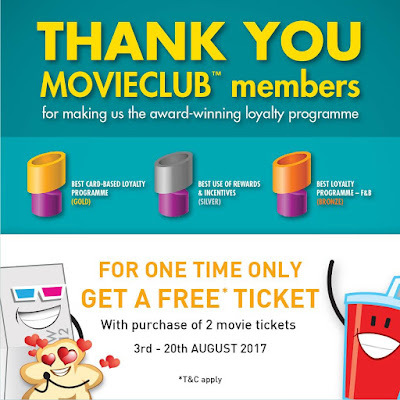 We wouldn’t have made it this far if it weren’t for YOU – our awesome MovieClub™ members! As a token of appreciation for your unwavering support (and for one time only) purchase TWO (2) tickets for any movie and get ONE (1) complimentary ticket! Purchased 2 x tickets on 1 Aug 2017, receive 1x Complimentary ticket within 1 hour. Valid between 1 - 13 Aug 2017. Purchased 2 x tickets on 2 Aug 2017, receive 1x Complimentary ticket within 1 hour. Valid between 2 - 14 Aug 2017. Thank you for letting us take you to the movies! Promotion period: 3rd - 20th August 2017. Purchase at least 2x tickets to receive 1x COMPLIMENTARY ticket. 1 Membership is entitled to only ONE (1) COMPLIMENTARY ticket. Complimentary ticket is applicable for any movies in STANDARD hall, STANDARD seat only.